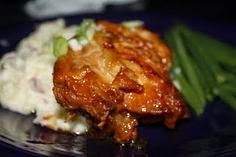 Here is another recipe from ThePioneerWoman.com that I absolutely love!!! Any time I can find a new way to cook chicken I am a happy girl. Since there were only four of us for dinner this particular night we decided not to use the quantities listed but the great thing was that it was no hassle to half! This recipe really needs no introduction as it can plainly speak for itself. I strongly recommend taking a look at the Pioneer Woman's blog as there are ample recipes that will fit any occasion from a summer supper, a mid-week meal or a dinner party for 25! Heat oil and butter in a heavy pot over medium-high heat. Place chicken thighs, four at a time, in the pot, skin side down. Brown both sides, then remove to a plate and repeat until all chicken is browned. Pour off half the grease, then return pan to stove. Add onions to pan and stir, cooking for 2 minutes. Pour whiskey into the pot, being very careful if you’re using an open flame. Stir and scrape the bottom of the pan, allowing whiskey to reduce for a minute or two. Pour in barbecue sauce, peach preserves, water, and Worcestershire sauce. Throw in garlic cloves. Stir until combined, then return chicken to the pot, skin side up. Cover and put pot in oven. Yummers!! I want to make/drink that!